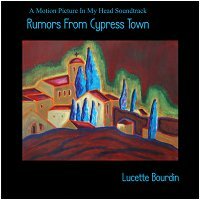 Ambient virtuoso Lucette Bourdin returns to Earth Mantra with yet another iconic collection of intelligent and evocative ambient pieces called Rumors From Cypress Town. Unlike her most recent masterpieces, the Silver Moon / Golden Sun / Radiant Stars trilogy, her latest release is highly cinematic, what Lucette describes as "A Motion Picture In My Head Soundtrack". The pieces are much shorter than on her previous releases, each reflecting a scene or a character out of this virtual story. Unfortunately, there are few clues as to the plot or the setting for this imaginary screenplay (which is sort of a bummer because we are intensely curious about it), but fortunately for us the score speaks strongly for itself. Like all of Lucette's work, the music is mature and thoughtful, brilliantly composed and chock full of her trademark performance emotion. What really knocks our socks off is how diverse the pieces are and how each one seems to strongly evoke a specific scene in the listener's mind, exactly the way a soundtrack ought to. Just when we think we have figured out Lucette's approach to her art, she goes orthogonal on us and delivers something completely out of the blue like this stunning album. Amazing. And stunning it is. We have long been huge fans of Lucette Bourdin and have gone so far as to call her one of the top ambient artists active today. But she has really knocked the ball out of the park with this one. If anyone ever doubted that she is ready to score films at the highest level, this album will dispel any such misconceptions. Her music has always been lush and magnificent, but she has added a new facet to her work that did not exist before, an inventive conceptual dimension that adds depth and character to her pieces without distracting one bit from the underlying music itself. The fact that she is able to create such an effortless story line while preserving all of the serenity and grandeur of her musical point of view is frankly astonishing. We could go on and on about how well composed this music is, about how the emotions ebb and flow majestically, about the excellence of her sound design, and about how perfectly all the pieces of her work dovetail into a work of enduring value. But rather than attempt to convey all this by words alone, we simply invite you, the listener, to download this album and listen for yourself. For we at Earth Mantra believe that Rumors From Cypress Town is one of the top ambient albums of 2010, and is nothing less than music for the ages. A must have for any lover of ambient music. A release of the kind I'd love to stumble upon more often... reminds me of good 90s style ambient music. No clicks and pops, just sheer acoustic beauty. Thanks for sharing. Quite different from her other releases. Very beautiful and relaxing 17 short ambient tracks. Listening second time right now.